Sift flour and baking powder together in a small bowl. Wisk in salt. Combine eggs and granulated sugar in the bowl of a stand mixer and wisk on medium-high for 1 minute. Increase speed to high and wisk for 4 minutes or when the batter roughly doubles. In a small sauce pan over medium heat, melt the butter, and dissolve brown sugar and honey. Remove from heat. Fold in half of the dry ingredient until combined. Add remaining dry ingredients. Pour the warm butter mixture over the batter and lightly fold until smooth. Cover and refrigerate for at least 4-6 hours. 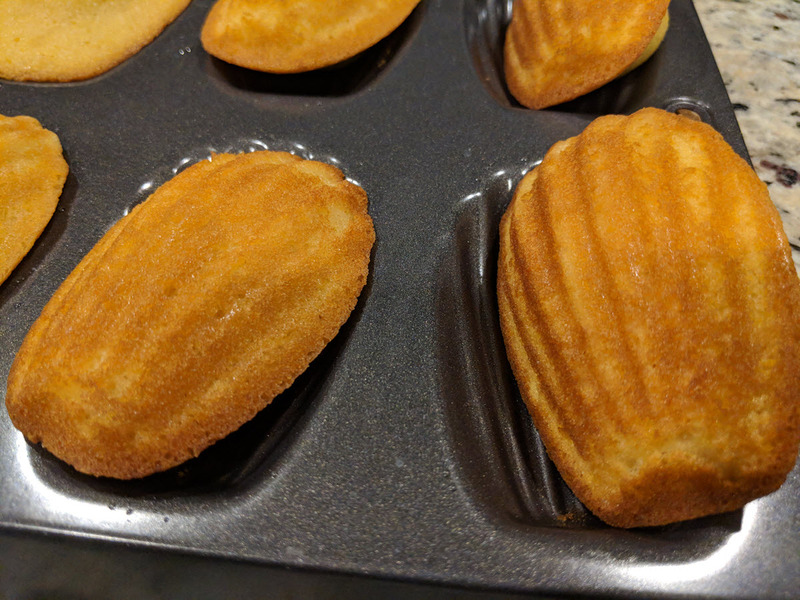 Butter madeleine pan with butter and place in fridge as well. Place 20 grams of batter into each of the 12 molds. Bake for 9-10 minutes when tops are lightly browned (bottoms will darken faster) and a wonderful hump will rise from the top.